There is still nothing official but the rumors that circulate seem more and more founded and on the phone the same mister does not formalize the news but neither denies it. 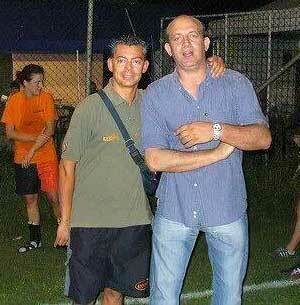 Leading the Vicenza Calcio Femminile next season 2014 / 2015 will be Alessandro De Bortoli, the former red and white coach who brought the team one step away from the A2 series six years ago, after a wonderful championship in the year 2007 / 2008 and touching the promotion, which he went to Fortitudo Mozzecane for a bureaucratic quibble. 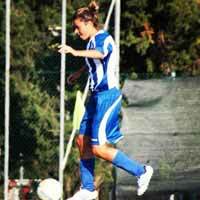 Mornino of origin, but residing in Treviso for a couple of years, De Bortoli from 2012 trains Vittorio Veneto Women's Soccer in Serie B, after leading the Favaro, Vicenza, Venezia Casinò and Mestre, all strictly football teams female, winning a Veneto Cup with Mestre. 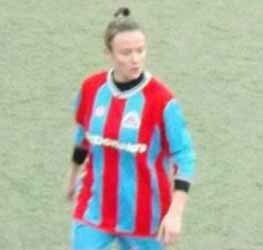 "Why did you choose women's football?" Everything was born by chance: at the beginning of the 2000 the president of Mestre, Ulisse Miele, my great friend, proposed to me to train the first team of the company and I accepted the challenge. From there I became passionate about this world and here I am. Today we introduce you to a very young soccer player wearing this Molassana jersey, junior category, with a lot of passion and spirit of sacrifice, talents that age (98 class), it is not so easy to find in her peers. Let's go immediately to listen to what he has to say. Start by asking yourself, Valeria, to introduce yourself to our readers. I'm Valeria Gardel, I'll be sixteen in September, I live in Fontanabuona and I attend the first class of the Caboto Professional Institute of Chiavari, socio-health address. Very well and now tell us how you approached football? Playing football has always been a great joy and since I was seven I have always wanted to be part of a team in order to really kick a football field. Actually maybe my parents did not understand at the beginning how great my passion was, so they directed me to volleyball, a discipline that I practiced for four years. 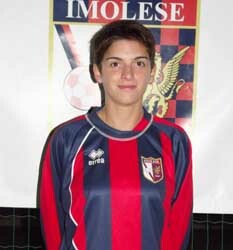 I have always hoped that in my valley a women's football team would form until ........ at the age of twelve, my dream finally came true, starting to play in the Virtus Entella of Chiavari. We have the pleasure today to have with us, for a short chat, the captain and leader of our first team, "nothing less than" Lucia Belloni, as always pleasantly available to undergo the ritual questions. Then Lucia are playing your third season with the Molassana jersey: a summary of your experience at Ca de Rissi. It has been three very challenging years but also quite positive. Being able to confirm each year at good levels is not easy and we are succeeding thanks to a technical and managerial team that allows the team to perform at its best. Have you noticed any differences, and if so which ones, between the current championship and those of five six years ago? One of the most obvious differences is certainly the decline in the technical level of the championship. 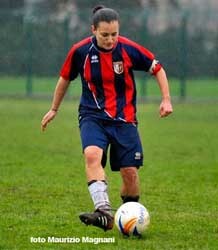 What would you suggest to propose to achieve a significant improvement for women's football in Italy? Unfortunately, the problems of female football are many and exist from the origins of this movement; I think I should increase the visibility of this sport, at the same time obliging the men's teams to have a female sector, without forgetting that to have appreciable results the imperative must be the synergistic collaboration of all the competent sports bodies aimed at disseminating this wonderful reality , women's football. 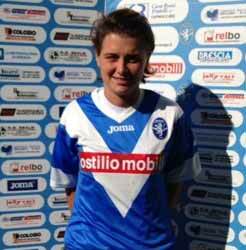 A chat with the feminine midfielder Serena Cavalcoli, a new purchase from San Zaccaria. Against Jesina what match do you expect? "The one on Sunday against the Jesi at home will certainly be a very difficult game. We know the Marches from the past season and we know that it is a team that likes to play good football and that will certainly try to play the game. We will need an important collective performance and we are ready to take the field with the utmost determination to bring home the result ". Do you consider a good point obtained in Arezzo? "Surely that Sunday can be considered a good point. It is never easy to go to the home of the second in the standings, among other things, the only undefeated formation of the Serie B championship and make the game by imposing their game and their personality. I think the only thing that we missed was the goal, touched several times before with a feat of Jennifer in the first half then with two taps in the final minutes missed. We have offered a good performance if we think that we gave the opponents only one shot on goal on the pitch. " 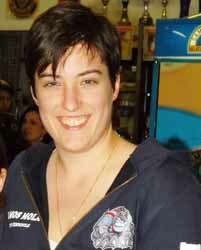 After the victory against Vittorio Veneto, the captain of the female Emolese Federica Funiciello takes stock of the situation. "We made an excellent match from the point of view of agony, determination, team solidarity and character. All of this, combined with a good dose of cynicism, was essential to win the game ". Four consecutive victories. What has changed compared to the first results? "At the beginning we simply needed a bit of running-in, getting to know each other better, putting together the mechanisms that are fundamental in a team. Although, at the beginning, the results were not the best we have always worked well and these victories are the proof ". 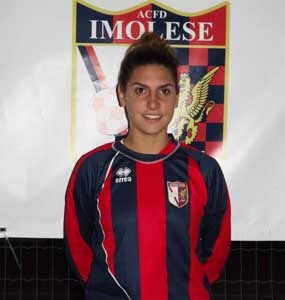 Two talks with the new tip of the feminine Alessandra Salvotti Alessandra Salvotti who looks to the match on Sunday in Foligno and returns to the home victory against Venezia Lido. On Sunday go to Foligno which has zero points. Technically I think there is no story, but that attitude do you have to have? "I think the attitude must be the same as a game played against the first in the standings. We need to continue our string of positive results, so we need to be grit, determination and humility without underestimating the opponent because, as we know, football is unpredictable ". First success at home. Why did you win? "I think it was a game that, in the first half, did not give a lot of emotions even if we had chances. We were a bit 'adapted to the other team then, in the second, we came out in the best possible way by giving us an important victory for us and our public. A smiling and excited Cristiana Girelli, stops at our microphones after the beautiful victory of Brescia on Verona in Verona. A special race for Girelli, for many years the flag of the Venetian team and now on the strength of the biancazzurre by Milena Bertolini. 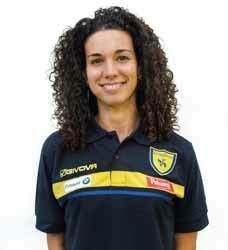 Cristiana, today a great Brescia has responded in the best way to the doubts raised after the race with Tavagnacco. Well clear, I think the doubts on that occasion have come to everyone and that's right. But I think that today the team has reacted well with a great test, both in terms of pride, both in terms of the game. We have always tried to respond to their launches with a maneuver starting from behind. We gave up a bit in the second half, but we had the stubbornness and the skill to keep the game and to find the 3-1, even with a little luck. Then on the three to one there was nothing more to do, the race is over there. How much emotion in re-covering the Olivieri ground, but this time no longer with the Gialloblù jersey? Large numbers. I was not expecting it sincerely, because in the week I lived it without thinking too much. Then this morning I started to realize and as soon as I set foot in the field it was a very strong emotion, especially when I gave my friends five to five because I was usually on the other side. It was really exciting. Now for you there is the national team. Will you give us another decisive goal like the one against Romania? Eh, we hope. It will be a very difficult game. Spain is the team that we most fear of our group and moreover we play with them. It will be tough, but we have a week to prepare it and I think the coach and the technical staff will put us in the best condition to face it. Valpo as a family and Verona as a city. This is the choice made by Irene Tombola, midfielder of Fimauto, one of the architects of the promotion in Serie A that since this year, in addition to the leap, has decided to try a new experience, leaving Padua and settling in our city. For Irene football has always been something special since the first day when he asked his parents for a gift for his eight years: playing football. "I always followed my dad and my brother - he remembers - and I immediately fell in love with this sport, it was not easy at first because I was practicing gymnastics with good results, even though I wanted to play football. to my parents, I started with the little ones ". Accomplice the fact that his father Carlo was training the Gordige, Irene moved to that society where, at 14 years, he debuted in series D. Then the passage in Venice where he played for nine years and where, remember, "I scored the most beautiful and important that allowed us to beat Lazio and save us ". Read more: Valpo as a family and Verona as a city. MARINELLI: "MY GOALS FOR A QUIET SALVATION"
In the week leading up to the first championship match, the young Grifo striker dreams of a protagonist season: "I dream of arriving in double figures". The home debut against Tavagnacco postponed to Sunday 29 September. 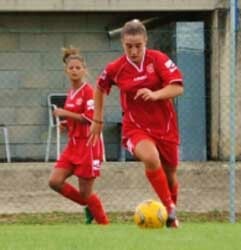 Gloria Marinelli, a young striker of the 1998 class, is in force at Grifo Perugia Femminile from the 2012 / 13 football season. He started playing soccer at the age of six with Agnone, a Molise male company where he reached the 'Giovanissimi' category, showing off mainly for the excellent performance. Her talents have not gone unnoticed and last year she found herself catapulted into a totally different environment but certainly more fascinating and suitable for her. Read more: MARINELLI: "MY GOALS FOR A QUIET SALVATION"
Virtus Bellaria leaves the Italian Cup head-on. Last Sunday's defeat at the home of Jesina for 4 at 0 is the result of numerous absences, as explained by the defender Rosa Cuomo. "In the Sunday challenge we had to roll up our sleeves and face an emergency situation: the many players who did not present certainly weighed, not least the lack of our bomber Fulvia Dulbecco We did everything possible, considering the high level of the team against which we competed, Jesina has a very good team and we unfortunately were not complete ".